At the tier 3 level, students who demonstrate very serious or chronic behavior problems are provided intensive and individualized supports. At the tertiary level, individual students are provided simple to complex function-based behavior interventions (FBA-BIPs) and person-centered plans such as wraparound. Please click here for a description of various Tier 3 presentations and professional development offered through the Delaware PBS Project. This link will take you to all of the PTR forms and tools! PTR Training Master Facilitators can use this PTR training to provide an overview of the PTR process to new facilitators and teams. DE-PBS PTR Page School based teams can use this information to gain information about training, coaching, forms, and advanced PTR resources. Thinking functionally About Internalizing Behavior Problems Tier 3 teams can use this FBA/BIP training to provide an overview about anxiety and school refusal to staff and build skills in their own facilitation of function indicated interventions for students with internalizing and school refusal behaviors. Tier 3 Redesign Team Presentation Teams can use this overview to understand and share information with staff regarding the essential elements of Tier 3 systems. Systems Development Tools DE-PBS: Tier 3 Status Tracker District coaches and teams can use this tool to evaluate the presence of key components of Tier 3 and create an action plan based on that evaluation. The Status Tracker assesses four areas (based on the Tiered Fidelity Inventory: Teams, Resources, Support Plans and Evaluation. 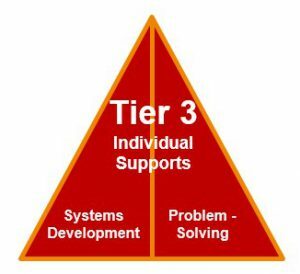 Florida Blueprint for Tier 3 Use this document as a guide to assist district teams to understand the Tier 3 structures needed to develop a results driven system for students in need of individualized behavioral supports. Support Plan Tools NEWEST PTR FORMS AND TOOLS! Use this link to access forms related to the PTR model of FBA/BIP facilitation. Coaching Professional Development Action Plan Facilitators can use these tools to evaluate their own competencies and Master Facilitators can use this tool while coaching peers in the FBA/BIP process. TATE Scoring Guide Tier 3 teams at the district or school level (or individual FBA/BIP facilitators) can use this tool to determine the technical adequacy of FBA/BIPs and establish baseline and data for improvement.